Once again, the world's eyes focus upon Hungary and her ground-breaking respect for civil liberties and the freedoms of her citizens ... Or maybe not quite. As if everyone wasn't busy enough ignoring the abuse suffered by Roma, the government have found a new group to bully - the homeless. 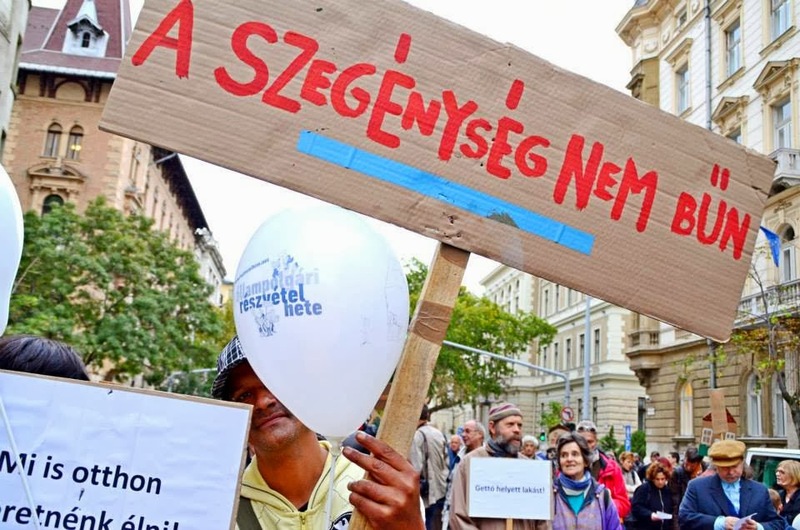 Yesterday, Lydia Gall wrote an article for Human Rights Watch reporting the worrying decision by the Hungarian government to make it a criminal offense for the homeless to live in public spaces. The law will come into force next week. Effectively, they have criminalised homelessness since the 30,000 who live on the streets would not be there if they had their own private space to go to. Fines, community service and even a jail sentence can be imposed for the crime of being vulnerable. 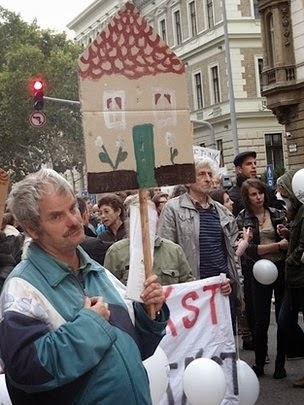 Protestors take to the streets in Budapest. Back in 2012, UN Special Rapporteur on human rights and extreme poverty Magdalena Sepulveda spoke about the possibility of such a law being passed. As we all know, the processing of criminal sanctions is extremely costly and should only be employed where it is the most effective method of deterrence. In this instance, if the ill aiming to be cured is homelessness, it would surely be far more effective to pump resources into helping people escape lives on the streets? Budapest has only 5,500 spaces in shelters and these are dormitory style rooms of 50 beds which are clearly inadequate for families and the very young. Instead of bullying those who cannot fight back, maybe the Hungarian government should look carefully at the ineffective services they provide and pick on each other instead.